Born at Diest in Brabant, 13 March, 1599; died at Rome, 13 August, 1621. His parents watched with the greatest solicitude over the formation of his character. He was naturally kind, gentle, and affectionate towards them, a favourite with his playmates, brave and open, attractive in manner, and with a bright, joyful disposition. Yet he was also, by natural disposition, impetuous and fickle. Still, when John was but seven years of age, M. Emmerick, his parish priest, already remarked with pleasure that the Lord would work wonders in the soul of the child. Many are the details that reveal him to us as he was in the Society of Jesus. He was but nine years of old when his mother was stricken with a long and serious illness. John would pass several hours each day by her bedside, and console her with his affectionate though serious, words. Later, when he lived with some other boys at M. Emmerick's house, he would undertake more than his share of the domestic work, selecting by preference the more difficult occupations. If he was loved by his comrades, he repaid their affection by his kindness, without, however, deviating from the dictates of his conscience. It was noticed even that he availed himself discreetly of his influence over them to correct their negligences and to restrain their frivolous conversation. Eager to learn, and naturally endowed with a bright intellect and a retentive memory, he enhanced the effect of these gifts by devoting to study whatever time he could legitimately take from his ordinary recreation. What, however, distinguished him most from his companions was his piety. When he was hardly seven years old, he was accustomed to rise early and serve two or three Masses with the greatest fervour. He attended religious instructions and listened to Sunday sermons with the deepest recollection, and made pilgrimages to the sanctuary of Montaigu, a few miles from Diest, reciting the rosary as he went, or absorbed in meditation. As soon as he entered the Jesuit college at Mechlin, he was enrolled in the Society of the Blessed Virgin, and made a resolution to recite her Office daily. He would, moreover, ask the director of the sodality every month to prescribe for him some special acts of devotion to Mary. On Fridays, at nightfall, he would go out barefooted and make the Stations of the Cross in the town. Such fervent, filial piety won for him the grace of a religious vocation. Towards the end of his rhetoric course, he felt a distinct call to the Society of Jesus. His family was decidedly opposed to this, and on 24 September, 1616, he was received into the novitiate at Mechlin. After two years passed in Mechlin he made his simple vows, and was sent to Antwerp to begin the study of philosophy. Remaining there only a few weeks, he set out for Rome, where he was to continue the same study. After the journeying three hundred leagues on foot, carrying a wallet on his back, he arrived at the Roman College, he studied for two years and passed on to the third year class in philosophy in the year 1621. One day early in August of that same year he was selected by the prefect of studies to take part in a philosophical disputation at the Greek College, at that time under the charge of the Dominicans. He opened the discussion with great perspicuity and erudition, but, on returning to his own college, he was seized with a violent fever of which he died, on 13 August, at the age of twenty-two years and five months. During the second part of his life, John offered the type of the saint who performs ordinary actions with extraordinary perfection. In his purity, obedience, and admirable charity he resembled many religious, but he surpassed them all by his intense love for the rules of his order. The Constitutions of the Society of Jesus lead those who observe them exactly to the highest degree of sanctity, as has been declared by Pope Julius III and his successors. The attainment of that ideal was what John proposed to himself. "If I do not become a saint when I am young", he used to say "I shall never become one". That is why he displayed such wisdom in conforming his will to that of his superiors and to the rules. He would have preferred death to the violation of the least of the rules of his order. "My penance", he would say, "is to live the common life... I will pay the greatest attention to the least inspiration of God." He observed this fidelity in the performance of all his duties till the last day of his life, as is attested by Fathers Bauters, Cepari, Ceccoti, Massucci, and Piccolomini, his spiritual directors. When he died, a large multitude crowded for several days to see him and to invoke his intercession. The same year, Phillip, Duke of Aerschot, had a petition presented to Pope Gregory XV for the taking of information with a view to his beatification. 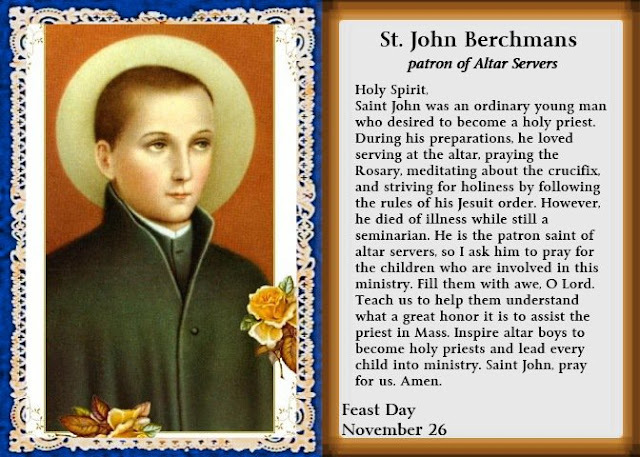 John Berchmans was declared Blessed in 1865, and was canonized in 1888. His statues represent him with hands clasped, holding his crucifix, his book of rules, and his rosary.